This post explores how to extract data from emails, automate backend processes and hence reduce repetitive tasks. It also provides an overview of how to integrate LOB applications using some of the solutions provided on this site. What options do you have when it comes to automating emails? Mail Attachment Downloader PRO versions offer a cost-effective solution to automating emails within your enterprise running as a service on a server or in the cloud through Windows Azure (PRO Server version required). The way this is achieved is using rules for emails. You can setup many rules for the software based on your needs via the UI. These rules can be run for a single email account or across many accounts simultaneously. Mail Attachment Downloader PRO Server lets you process incoming email on a scheduled frequency in the background 24×7 unattended as a Windows service. It can recover from system restarts automatically, runs in the background even when no user is logged on and can also data center failure if a hot-standby is used to do so. It can also be run in the cloud using Windows Azure if needed. The rules defined in the program are run top-down for each email and attachment. The first matching rule is used to download any emails or attachments within the email. If no rules are defined, then all emails will be downloaded. 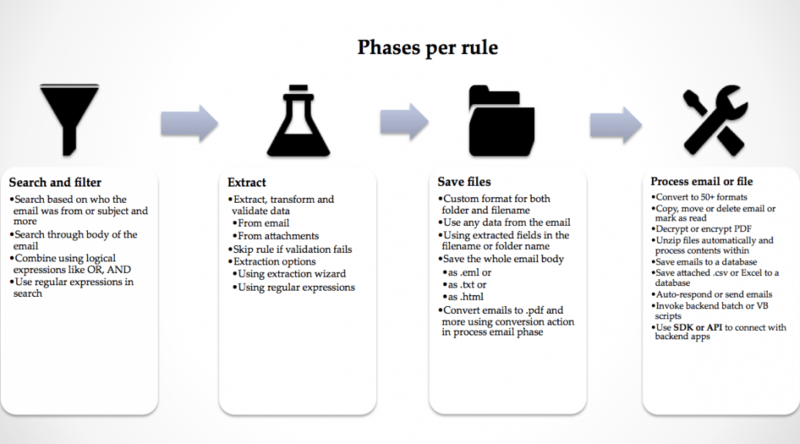 The software breaks down processing emails into the following phases for each rule as shown. 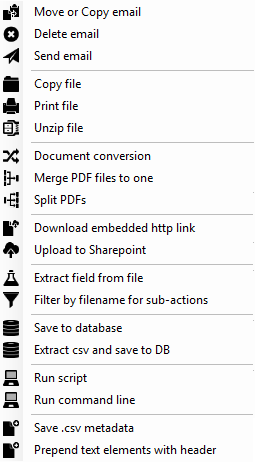 Save files: Specify the format and location of where you want any files to be processed to be saved. This could be a temporary location if you do not want this data permanently stored. This could also include a file share (use UNC path). Process email and files: This last phase is used to run the automatic processing and includes many different actions as shown below. These can include nested actions for example, unzip a file, decrypt a PDF, extract data and save the information to a database. Once these are setup for a rule, you can enter many such rules. If you have multiple email accounts to process, you can restrict a rule to apply to only one email account if needed by using an account filter (Add -> Filters -> Account email in the rule). We now offer an SDK or plugin API to integrate with your backend systems in a more seamless manner. Contact us for more. Use our PRO SDK (Software Development Kit) to integrate directly with your LOB applications. We have provided a brief overview of how to automate data from emails within your enterprise using an on-prem service or a cloud-based self-hosted service using Windows Azure using Mail Attachment Downloader PRO. If you have a specific use-case that is not covered let us know or if you need help integrating your backend systems we may be able to offer consultation services to do so.